Patron of the Orochi and Other untap effects. Enchanted creature can attack as though it had haste. : Untap enchanted creature. Activate this ability only during your turn and only once each turn. 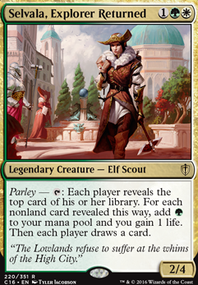 Well, I am a fan of Selvala, Explorer Returned . 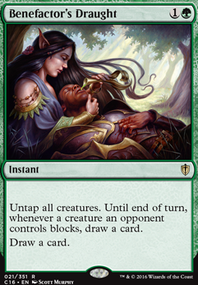 A group-hug effect tacked onto a name more recognizable in its mono-green form, however, I found that Selvala, Explorer Returned gives roughly 3-4 mana on tap. That is an amazing advantage. 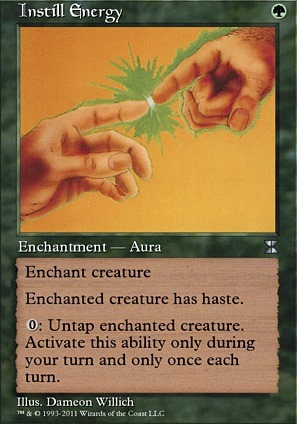 Take abuse of this, with effects like Smothering Tithe , Well of Lost Dreams , or Paradox Engine , use more untap-effects like Instill Energy , Quirion Ranger , Scryb Ranger , Wirewood Symbiote , Vitalize , Nature's Chosen (A favorite), Emerald Charm , and numerous other green untap effects that cost less than the tap on Selvala herself, and you can storm off through your deck, just trying to find Paradox Engine , Well of Lost Dreams , or another payoff, and you will draw your deck. Run any number of wincons, a favorite of mine being Altar of the Brood , Cloudstone Curio , Instill Energy , and Nature's Chosen , or whatever you want, and you get to mill out each opponent. How do you do this when you have to draw your opponents ~20-30 cards when going off? Silence or Autumn's Veil , Grand Abolisher , City of Solitude . Whatever you want! BobL: I am utterly elated to receive the first comment with actual constructive criticism (with hands-on experience) and criticism that I don't intend on taking lightly. However, I would love to hear even more about your experiences, so I was hoping you wouldn't mind adding me on Discord Inkmoth#4507 (if you have one) or your preferred method of contact, I'd like to know every shortcoming, so that I may find a way to fix it. Elvish Harbinger : Will be going in the deck, as per your recommendation. It makes total sense, especially when you get some of the best tutors the deck has to offer. I was REALLY against it in the non-budget, but in this deck is seems more than perfect. Guardian Project : Another one I wasn't a fan off during the developmental stages of the non-budget, but it seems perfect in this context. I will also be looking for a slot to put this one in. Scryb Ranger : It's been one of those cards that I REALLY wanted a slot for in the non-budget version, but never could. I stuck it in here recently and the 3 games I've had with it in, it never showed up, so it hadn't gone through the rigorous testing I tend to put cards through and for that I apologize. I figured if the main deck wanted it so much, why not stick it in the budget version since we lost Instill Energy . Thank you so much for your comment! It honestly made my day and gave me something to work on today. multimedia on Counter, my Counter! Hey, to make your deck more competitive consider building around Darksteel Reactor , Magistrate's Scepter and Sage of Hours ? A strategy around Biovisionary is not worth it because it forces you to play a bunch of bad high mana cost cards to enable it. 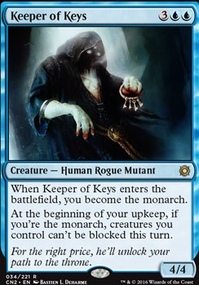 What you want with Reactor/Scepter are cards that can untap Vorel to be able to use his ability more than one time a turn as well as other cards that interact with charge counters. You also want tutors for artifacts. With Sage you need to get a counter on him either with graft (Frogling), moving a counter from one permanent to another (Conduit) or target him (Bioshift). Coretapper : Reactor, Scepter, Prism, Everflowing, Cornucopia, Cannon, etc. use charge counters. Thousand-Year Elixir : gives Vorel haste and untap. Instill Energy : gives Vorel haste and untap. Tezzeret the Seeker : can be a repeatable tutor and put onto the battlefield either Reactor or Scepter, etc. Many of these cards are budget and cards like Study are expensive price, but entirely worth it if you're trying to be more competitive. Toothy, Imaginary Friend is a good creature with counter strategies and all these draw spells especially repeatable ones such as Remora and Study can really pump it. Fauna can be a repeatable creature tutor which is very helpful when your budget can't afford all the expensive price tutors. When playing Toothy you want Reliquary Tower because Toothy can draw a lot of cards and you want to keep all those cards in your hand. I offer more advice :) Good luck with your deck. No Problem hkhssweiss I had some time on my hands that I didn't feel like doing anything else with and remembered you pinged me in a comment not long ago :) I did spot some nice cards Instill Energy as a maybe for Vorel The Countdown that I'll see if I can fit in for the super cheap haste and free untap! Brilliant stuff! 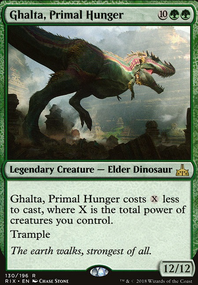 and Mirri's Guile as a maybe for Sasaya Legion (a fun quirky green deck I'm working on) to be able to get lands if/when I need them in my next draw. All good stuff. Tuvasa of the Eternal Aeon | Primer was one of my favourites. Liking the enchantment synergies. Lazav, Corpse Connoisseur (Control) Just like the way it seems like it would play. denis1198 I have tried Instill Energy , Woodland Bellower and all the aforementioned cards, aside from Rhonas the Indomitable . Fierce Empath is a dead draw in many games and is not efficient enough to net wins: a three mana tutor is not something we need, particularly when it only fetches Great Oak Guardian (within my list). Hall of Gemstone is a strictly defensive option for a different deck. Though it's ability is nice, many players will be operating with a series of rocks to net the mana sufficient to play counter magic. Also, it's a World Enchantment; part of our win condition is using Concordant Crossroads to finish our opponents off on Turn 3. HoG will immediately be replaced. Fauna Shaman is a lesser Survival of the Fittest , which we operate with. While Shaman can be tutored for, you can see how it's counter-productive to simply obtaining the card we actually need with all of our Creature Tutors. Primal Command in many cases is an overly-expensive Tutor. The loop with it & Eternal Witness is just as unnecessary to our success as the Beast Within loop I explained here. It's what you would consider a "Win More," while we're only really looking to "Win." Priest of Titania is insurance for Selvala and strictly Plan B. She's extraneous in our deck list. Our game should be centered around using Selvala for victory. While her potential to ramp (in some deck versions) is decent, it is no substitute for Selvala. Between all of our current options for ramp, sticking with Plan A - casting & using Selvala - is always the priority and easily achievable. Dosan the Falling Leaf would be a much better consideration to fit into the deck, or Prowling Serpopard , as either of these (particularly Dosan) will help us Combo out on our turn and do so unaffected by our foes. However, even these are wanting in the list currently... I've tried about everything. Rhonas is fine, but would only act as a substitute for Wayward Swordtooth who is superior. The Swordtooth's ability to play an additional land can help us achieve the mana we need in a given turn to go off, via utilities such as Quirion Ranger & Scryb Ranger . Bouncing the Forest and being able to play them again is a larger benefit than paying three mana to net +2/+0 from Rhonas. Those synergies are more valuable to consider. Thanks for the comments/considerations! That's always been a problem, especially when your meta knows full well she can be a problem. My go to protection has always been either Shielding Plax or Vanishing / Pemmin's Aura . I don't like instants in my current build due to the fact that I like the density of what I draw when I go "off" in drawing all the cards. There are times where you draw too many non-enchantments. If I add in those things I will be diluting the deck. 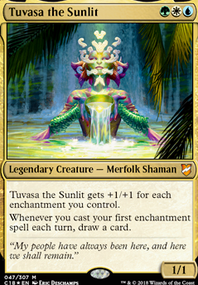 However there are alternatives, if you are afraid of people targeting Tuvasa than I would recommend first Devoted Caretaker she protects Tuvasa from all targeted spells, plus she is reuseable not to mention she protects not just Tuvasa but any permanents. 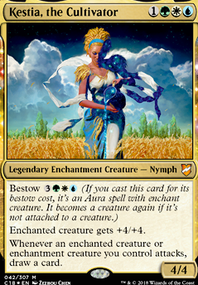 The next one is Mother of Runes , the only downside to her is that when you call a color any enchantment of that color will fall off, and since most of Tuvasa's best enchantment colors are white most of them will fall off due to the targeted spell being a Swords to Plowshares or Path to Exile . Other than that, run a lot more protection type auras or hold back mana. We do have haste in the form of Instill Energy so you can always hold back from casting certain spells until you have enough mana to do everything you need. Luckily she only costs , so if she gets removed once it isn't as bad as recasting her until her tax is 3x. Hope that helps you buddy! Savage Summoning lets you opt in at the end of an opponent's turn, bypassing summoning sickness on your turn. My reason for this; My current build only has one 3 CMC artifact, so it doesn't have much value in this build. Instill Energy literally does the two things I wish every card in this deck could do. Fantastic addition to the 99. I have also removed Birthing Pod and replaced it with Natural Order . My reason for this; Birthing Pod was a dead card for me in many of my play tests. More times than not, it never seen play. I'm still wary about taking it out, but Natural Order just puts in so much work, and essentially acts as a Tutor Flash . The value added vs value taken heavily weighs in it's favor.